While I was taking my beginner quilting class in November, I caught the quilting bug and made this quilt top. This was the first time I went to the quilt shop and picked out the fabric all by myself…huge accomplishment. I was a bit overwhelmed at first, but then I remembered my teacher saying “start with a fabric you like, and go from there.” That’s exactly what I did. The pattern is called Fat Quarters Gone Wild and designed by Darlene Szabo and Debby Bond from Sew Graceful Quilting, and the quilt top measures 59 x 60 and is not quilted…yet! I cannot find this pattern. Can you direct me to it? 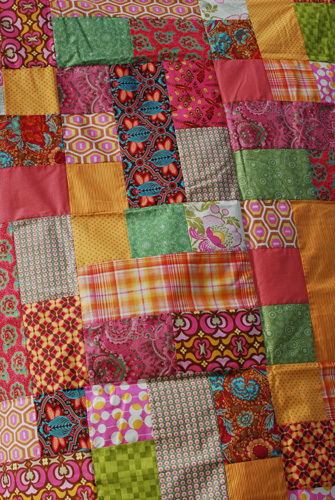 Do you have a pattern for the scrappy fat quarters quilt? I am a beginner in quilting and this looks rather easy to do. Thank you. When I was requesting the pattern the “Fat Quarters Gone Wild” quilt, I referred to it as the “scrappy fat quarters” quilt. Please tell me where I can obtain this pattern. Thank you. The link is in the second paragraph of the post Hope this helps! Tried clicking on Fat Quarters Gone Wild in your scrappy fat quarters collection and got an “item not found” message. Could you please direct me to the pattern? 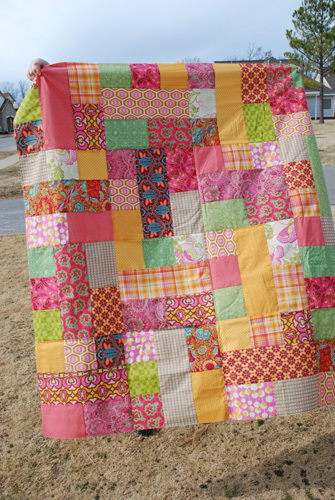 I would love some guidance on how to make this quilt. I can’t find a pattern anywhere! HELP! Do you have a pattern? What sizes did you cut the fat quarters into? There is no link in the second paragraph. I hope I can find this pattern. This is a great pattern! I love this quilt. Can you tell me the size of the blocks and pieces? Thank you.